The Tria 4X has a great reputation and it's the only FDA-approved and clinically proven laser for safe use at home. The laser is the most powerful you can choose to get your best results for years to come. I recommend it for hair-free results on face and smaller areas with lighter skin tones. But it's not for everyone. There's more you need to know before you choose it. 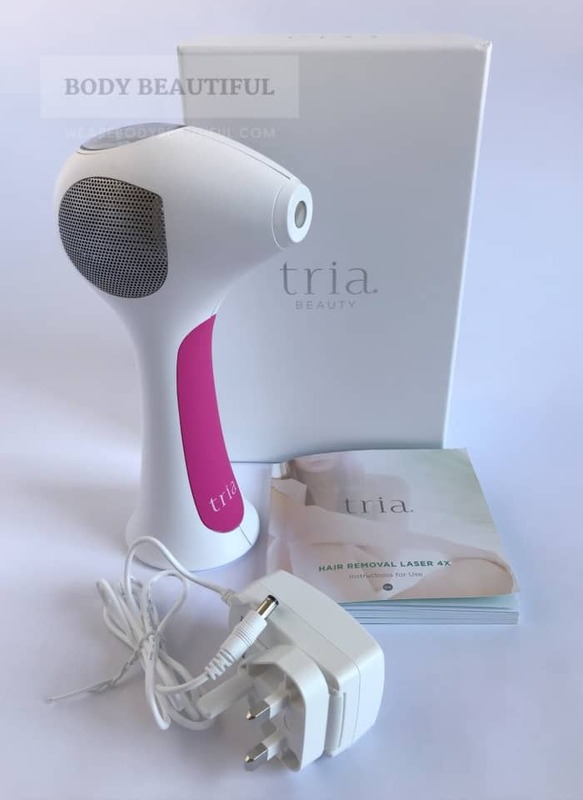 Read this full tried-and-tested, in-depth Tria 4X hair removal laser review to learn more. The Tria 4X is great value especially for your face and smaller areas. You’ll get enough pulses to get great results and maintain them for several years. It’s intuitive and easy to use, but it takes concentration and precision. 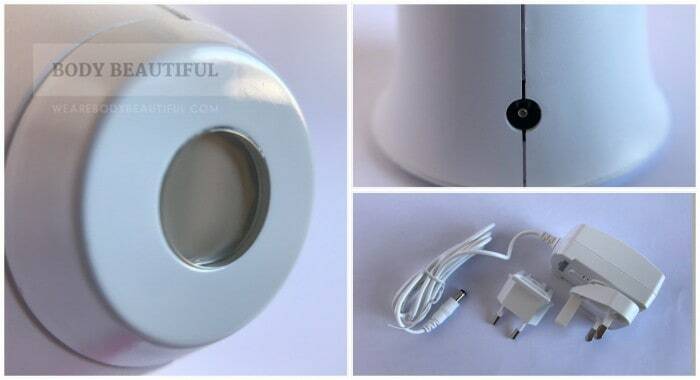 It’s good for smaller body areas you can complete with one charge of the battery. Some find it stings on the higher intensity – learn more in the full review. You can cover your face and either both underarms or bikini line in one 30 minute charge. It takes time and concentration to treat small areas. Tria give responsive and comprehensive pre and post sales support and offer money back guarantees too. Lots of love mixed with some valid criticism. Read this in-depth round-up to see the full picture. The Tria 4X is expensive at full RRP because it’s the only FDA-cleared home-use laser. But great deals are available. Read the full review for more. Is it fast to apply? What do the online Tria 4X laser reviews say? 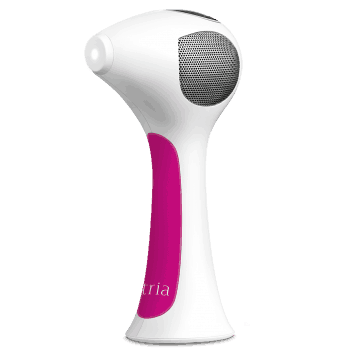 The Tria X4 is a diode laser hair removal device that’s safe for home-use. You can use it on body and face. After each treatment fewer hairs grow back, and what does grow back grows slower and is lighter and finer. You’ll eventually be smooth and hair-free. Occasional treatments maintain your results. Use it on black, dark brown and brown hair and light to mid brown skin tones (Fitzpatrick skin types I to IV). 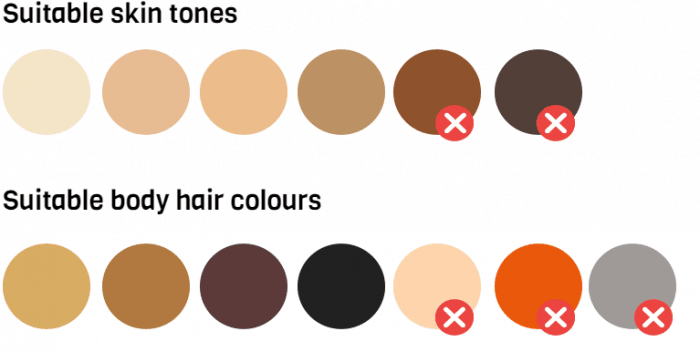 It won’t work on blonde, red, grey or white hair and it’s not safe for dark brown, brownish black and darker skin tones (Fitzpatrick skin type V and VI), or on freckles and moles. Both laser and IPL hair removal give great results. But the Tria is the most powerful home use device. It’s 3x more powerful than the leading IPL. So this increased energy promises longer-lasting results. Therefore, once you’ve completed the regimen and got to hair free, you’ll need fewer treatments to maintain these results. 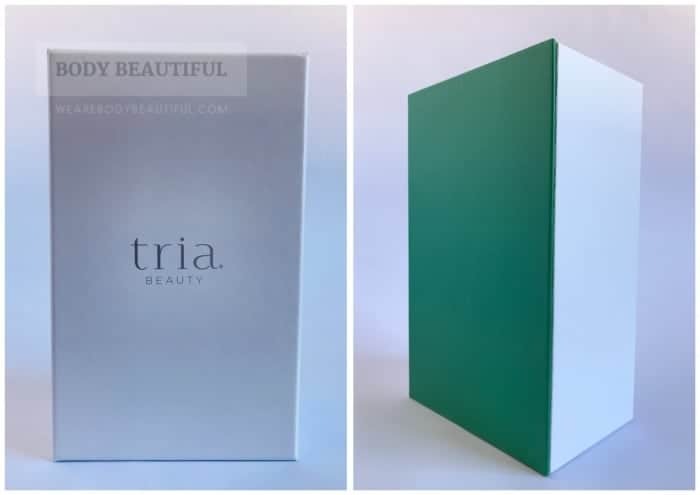 Tria Beauty, Inc. manufactures the Tria 4X. pH Beauty own and manage Tria Beauty, Inc. along with other leading hair removal brands Iluminage and mē. The Tria 4X is the latest model released in 2014. The Tria 4X laser is FDA-cleared and available to buy in the USA and Canada. It has CE certification to meet EU safety standards and is available in the UK and Europe. It’s shipped globally by CurrentBody.com with a 90 day money back guarantee. The Tria 4X is a home-use diode laser. 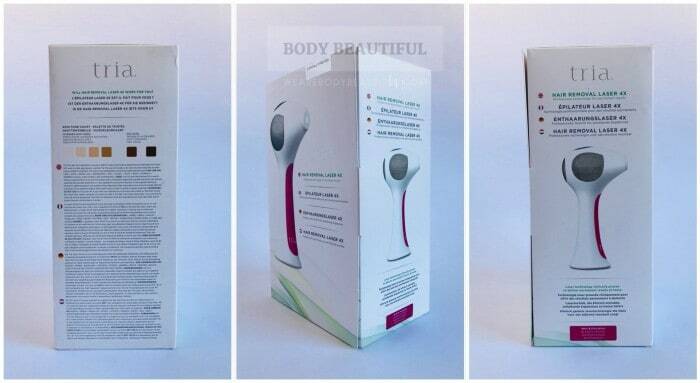 It’s the most powerful available in home laser hair removal so it promises the fastest and longest lasting results. But it requires the most commitment, time and patience of all home laser hair removal devices too. Learn more in this in-depth review. Tria recommend you treat your hairs a total 8 times at 2-week intervals for up to 3 months, or until you are satisfied with the results i.e. you may need less or more. This gives you substantial visible reduction in hair regrowth. Tria Customer Support also advise it’s after 6 months of use that you’ll see ‘permanent results’ (more on this in the full review). Then you can do the occasional spot treatment on new hairs. The Tria 4X wins my Best Buy for long-lasting home laser hair removal. It has a great reputation and many loyal advocates. People choose it specifically because it’s the most powerful home-use device available promising the longest-lasting results. But please read this full review to learn everything about the Tria 4X. Find out which body areas it’s best suited to, how fast it is to apply, if it really is permanent, and does it really hurt? The Tria covers your skin 0.5 cm at a time. You also get a minimum 300 battery charge cycles. Each charge cycle gives you between 500 and 600 pulses. So, assuming 500 pulses, that means you can cover a minimum total body area of 75,000 cm2. NOT to scale!! The Tria has a small laser aperture opening slightly larger than 5mm in diameter. You move the device 5mm at a time in an overlapping pattern across your skin. So it takes several pulses to cover just a small area. It’s the total number of battery charges that determines how many pulses you get overall. The more body parts you use it on the more charge cycles you’ll use. You may get many more battery cycles than 300, but I’ve used this minimum to calculate a cautious device lifetime based on pulses. According to Tria you’ll need 6 months of use to see ‘permanent’ results (there’s more on permanency later). Let’s use this as a gauge and assume you’ll need infrequent top-ups after 6 months. Worst case, 6 months equals 16 uses (x1 every 2 weeks). Based on my rough calculations the Tria gives at least 18 full body treatments (full legs, tummy, bikini line, underarms, forearms and face). So, that’s the 6-months covered and a few extra full body top-ups. If you get the best possible results you’ll only need occasional top-ups. Therefore, it lasts at least 1 year of use, probably several more. The manufacturer warranty lasts 1 year too. So, if you stick to the 2-week treatments for 6 months you should reach your best results before the warranty expires. This gives peace of mind as you can return it to Tria for a replacement should the flashes ‘run out’ or any other fault develop. N.B. I don’t recommend the Tria 4X laser for full body treatments or large areas. Keep reading to the ‘Is it fast to apply?’ section below to learn why. The minimum 75,000 cm2 equates to at least 50 complete small area treatments. That includes face, underarms, bikini line and forearms. So, for the face and smaller areas the Tria 4X is great value. It covers the initial 6 months of use and then roughly a further 3 years of monthly top-ups. With the best results possible you’ll only need occasional top-ups much less frequently than monthly. So, it’s probably going to last several years of use. N.B. I’ve used only the minimum battery cycles shared by Tria and the guideline number of pulses per charge to calculate the years of use. General usage, battery care and wear and tear can also affect how long the machine keeps working. In my user manual dated 2015, it states the expected service life of the Tria 4X is 3 years. What’s the Tria 4X like to use? The box is compact, matt-white, attractive and surprisingly heavy. On the front and sides are images of the Tria 4X. This European edition has information printed in English, French, German and Dutch. The box notes the safe-use skin tones and it’s effective on light brown to black hair. It clearly states the Tria is clinically proven and it gives permanent results. There’s a section that says it uses the same diode laser technology as professionals. But please note the Tria 4X has much reduced laser power energy compared to professional machines. This makes it compact and safe for home-use. There’s a flap that opens in the outer box printed with more detailed information. It explains how the laser works and what results to expect after a few uses and after 3 months of use. It notes the Tria 4X’s key features, that dermatologists prefer laser to IPL, how frequently to use it and briefly how to use it. After removing the white sleeve, I find a smooth and sturdy green and white-lidded box. Printed on the top and side of the lid is a silver Tria Beauty logo. It’s beautifully done and I can’t wait to see what’s inside. Remove the outer sleeve and there’s a sturdy white and green box. Gently lift the white lid – it slides slowly from green base. Don’t do it the other way or you risk the laser device rolling out. With the green box sitting flat and secure, gently slide off the white lid. Inside, nestled in a white plastic moulded bed is my Fuchsia Tria 4X. I slowly pull the green ribbon to lift it out. Beneath is the charging cable in a small green Tria branded cardboard box and the small square user guide booklet. The white plastic mould bed of the Fuschia Tria 4X sits securely on a small lip inside the green box. Use the green fabric tab to carefully remove the laser and find the user instruction booklet and charger below. It’s heavy. It weighs just under 600g but as I hold the handle at its narrowest part I notice how it feels balanced in my grip. The Tria is quite heavy. It weighs just under 600g. That’s because of the rechargeable battery inside it so you can use it cordless. Regardless, it’s balanced and comfortable in my hand. Most of the weight is in the rounded head where there’s an LED display screen. The treatment end tapers to a small round laser aperture opening. The business end is tapered to a small round opening. The LED display screen sits on the top. Don’t forget to treat this expensive bit of kit with care! The white plastic case has a slight sheen and it’s smooth. It doesn’t creak or bend. The long handle feels a bit hollow but I like the pink silicone-type grip and the fluted flat bottom so it stands up on its own. The Fuschia silicone-type grip and tapered handle prevents the device from slipping out of your grip. The bottom is flat so it stands up on its own. The laser aperture is a small round opening just over 5mm in diameter. And there are metal honeycomb vents in the sides and back. Overall this little guy has quite a bit of character. It reminds me of someone but I can’t quite think who? Does the Tria 4X laser remind you of anyone? It feels solid and a quality build, but I’m mindful to treat this expensive bit of kit with care. I plug in the charging cable and that to the mains and sit down to read the instruction booklet. The user instructions look great. Tria have designed them beautifully. They’re well laid out, logical and easy to read. 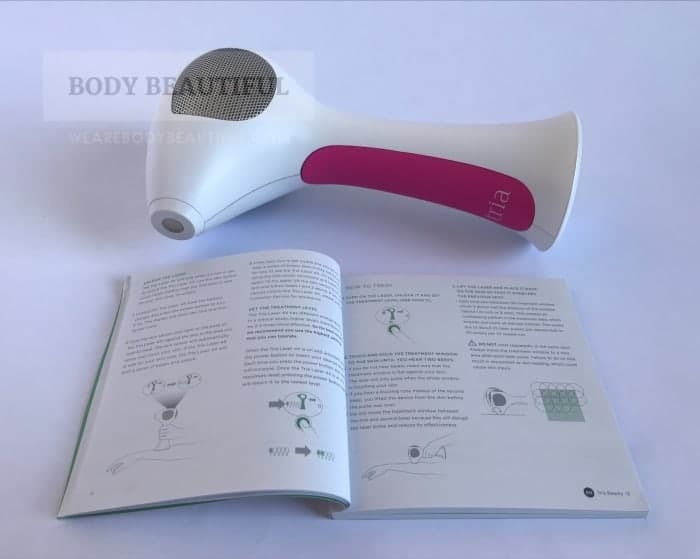 The manual concisely explains how the Tria works to reduce hair, uses diagrams to show the features of your Tria 4X, clearly outlines what results to expect and tells how to use it step-by-step. Please pay close attention to the list of risks, warnings and contraindications or reasons you should not use the Tria 4X. The tone is clear and simple. There are no errors. However, I’ve found additional helpful information from Tria Customer Service during research. That’s later in the review. The user manual booklet looks and feels great in a small booklet design – the print is quite small though! Please pay close attention to the list of risks, warnings and contraindications or reasons you should not use the Tria 4X. This sounds great and sets expectations you’ll see fantastic results and fast. But that’s not the case for everyone. Please keep reading to the round-up of the online feedback to learn more. The user manual advises a test patch at each of the 5 intensity levels in your treatment area. This is both to try which levels are tolerable and test you’ve no skin reactions. Charge your Tria 4X for 2 hours. Shave a small test area big enough for 5 spaced out pulses. Start at level one. Place the laser on a test area until you hear 2 beeps. Lift it from your skin. Using the power button move to level 2, position on a new skin patch and wait for the beeps. Repeat this for all the intensity levels but stop if you’ve reached your comfort limit. Wait 24 hours and if your skin is normal continue with your full area treatment at the highest level you’re most comfortable with. Wait 24 hours after your skin test and if it’s good you’re ready to get started. It’s simple. Here’s how you do it. If you move the laser before the pulse finishes it buzzes at you. It sounds like it’s blowing a small raspberry at me. I find this quite amusing. But it’s probably just me. If this happens try again on the same spot. As the Tria heats up you’ll hear a cooling fan start up inside. This operates intermittently as you use it. It’s not too annoying. You won’t see any flashes of light escaping from the Tria because the laser focuses down into the skin. I’ve used the Tria to treat my chin and upper lip, a few stray hairs on my legs and bikini line. Here’s my thoughts and feedback. I hope you find it helpful! It’s battery operated so there’s no cord to get in the way. The LED display sits on top along with the power button. 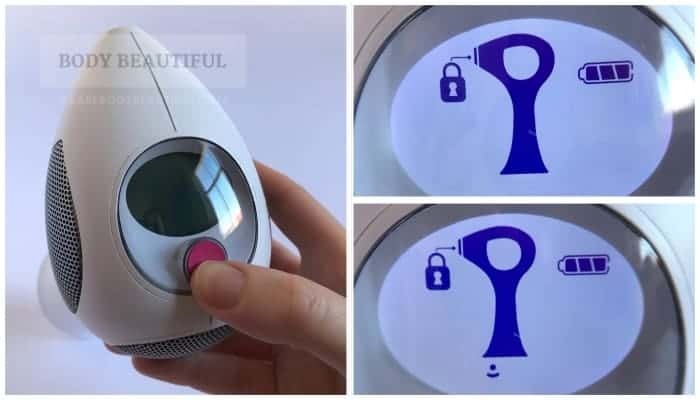 There’s a skin tone sensor on the bottom of the handle. With no other controls, it’s not in the least bit intimidating for a laser device. Let’s start with the LED display. There’s an LED screen under a protective plastic shield. Below it is the power button. You use these to control the device. It’s simple and straightforward. When locked, the LED screen displays a diagram of the Tria’s anatomy showing the battery power remaining, padlock icon, and skin tone sensor status. From left clockwise: 1) Press the pink power button to turn on the device in locked mode. 2) The LED screen shows a padlock and a battery icon with much charge the battery has. 3) Then a sensor wave icon shows. This means the skin tone sensor is ready. When unlocked the LED screen displays the laser intensity levels, the battery status icon and a pulse counter starting at zero. 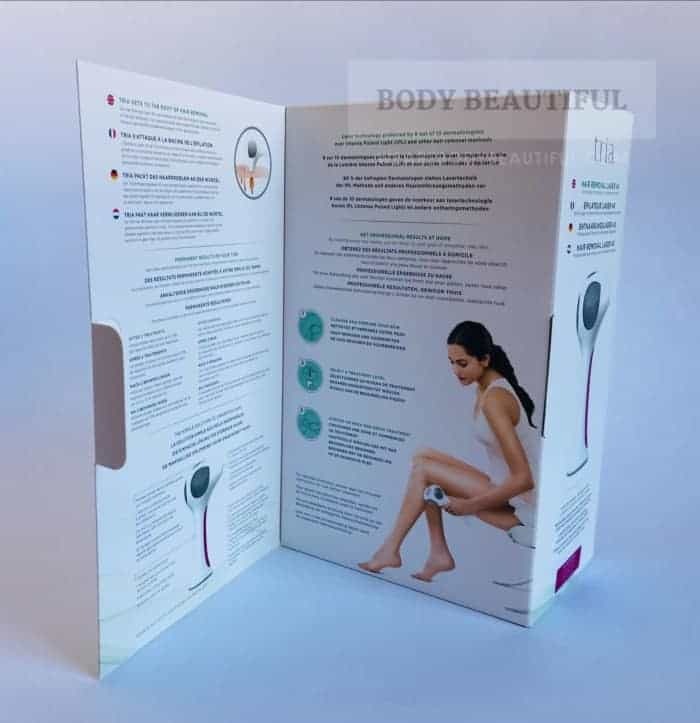 The user manual provides an estimated number of pulses per body area so you can compare and see if you’ve zapped enough. When unlocked the LED display shows the battery status icon, selected laser intensity level (1 to 5) and a pulse counter (here shows 11 pulses). The pulse counter resets each time the device is unlocked. When you power up the Tria the LED screens illuminates and shows the battery power and a padlock icon to tell you the it’s locked. A sensor icon then shows to tell you the skin tone sensor is ready. Place the red light on the bottom of the Tria handle against your skin in the area you’ll treat. The sensor scans your skin and if it reads a safe skin tone (Fitzpatrick I to IV) it beeps confirmation and then both icons disappear. If your skin is too dark it won’t unlock and you can’t use the Tria because it’s not safe. When the sensor icon shows the skin tone sensor is ready. Please the red light on the base of the device against your skin in the treatment area. When a safe skin tone is detected the device unlocks. The laser only pulses when the whole laser aperture is touching your skin. This prevents accidental pulses near your eyes. The Tria laser is also a Class 1 laser. This means it’s safe and poses no hazard to your eyes when in use. Next, how to select your intensity level. The Tria 4X has 5 intensity levels, 1 is low and 5 is high. Once the skin tone sensor has validated your skin tone it automatically sets to level 1. You’ll see 1 power bar on the LED screen. You simply press the power button to cycle up the levels and back to level one. The Tria defaults to laser level 1 when the device is unlocked. Press the power button to cycle up the levels to level 5 and back to level 1 again. The power density output ranges from 7 J/cm2 at level 1 to 22 J/cm2 at level 5. The higher levels are most effective – approximately 2 to 3 times more so than the lower ones. The power density output ranges from 7 to 22 J/cm2. 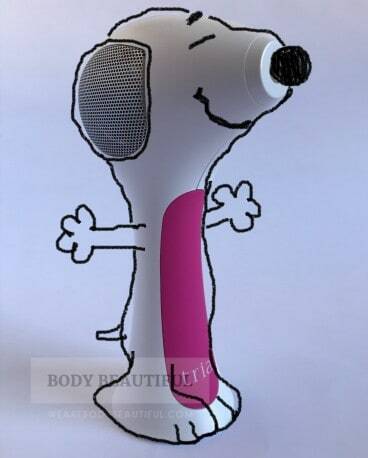 That’s the strongest of all home-use light energy hair removal devices. Based on the acknowledged fact the stronger the intensity the better your results, it follows that the Tria promises the best results of all home-use laser and IPL hair removal systems (if you use the highest settings). Sounds great! 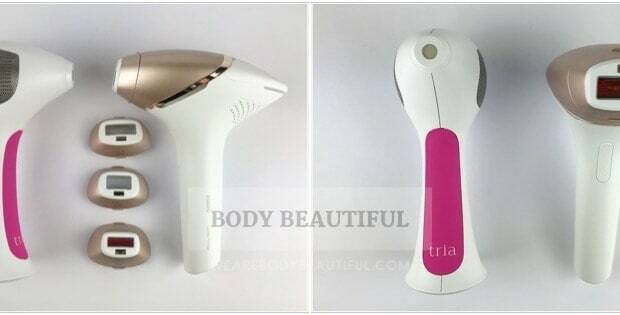 Loads of people choose the Tria over IPL hair removal systems because it’s more powerful. They want the best possible results in the shortest time. However, there are 2 important considerations that may influence your choice; how much it hurts and how fast it is to cover your skin. Or learn if it really does hurt! With home IPL hair removal devices, you use a higher or lower intensity based on your skin tone. Because the Tria is a laser it’s different. All levels of the Tria are safe for up to medium skin tones (Fitzpatrick type IV). Tria advise you use the highest power you can tolerate as this gives the best results. A clinical study suggests the higher levels are 2 to 3 times better than the lower ones. The laser targets the hair follicle so the higher intensity causes more heat and thus damage. It’s this increased heat which means it can hurt. This should get less after more treatments as fewer hair follicles are active. Understandably, Tria don’t dwell on pain on their websites and videos. It’s not even mentioned in the FAQs, despite being such a key conversation point in the online reviews. They do say it varies by user and the sensation for some may be like “a rubber band snapping against the skin, or a warm pricking feeling”. The reviews confirm it does vary by user. Some report it’s painless and some say mild to moderate discomfort. Many don’t mention it at all. But almost 16% of the user reviews say it hurts much more than advertised. It’s not just mentioned in the negative feedback. The neutral and positive ones say so too. Overall the pain-factor feedback is a much bigger percentage relative to home IPL reviews. Tria also sell SmoothStart Calming Gel to numb your skin before treatments. (Hmmm. I guess they’re aware some feel at least heightened discomfort). However, reviewers share they use ice and lidocaine gel to numb their skin because it’s much cheaper than Tria’s alternative. So, for some people it hurts. Unfortunately, there’s no way to know how you’ll feel, but be aware it’s possible and weigh this up in your decision. IMPORTANT: The Tria still works at the lower power levels. However, several users claim it’s not worth it and are determined to use the highest power despite enduring significant pain. Don’t let these mislead you. Many reviewers use the lower settings and still get great results. I’ve not marked the down the score for the Tria because it ‘might’ hurt. You need to simply be aware and let this inform your decision. What else do you need to be aware of? The laser aperture is very small – just over 5mm. So, it takes a lot of pulses to cover your skin. Coupled with this, each battery charge lasts for around 25 to 30 minutes of use (around 600 zaps). You then need to recharge the Tria 4X for about 2 hours. This means it takes a lot of time, organisation and commitment to complete your treatments. The small round laser aperture is just over 5mm. You need about about 40 pulses per 10 squared centimetres or 25 pulses per square inch. Each battery charge lasts for around 25 to 30 minutes or around 600 zaps then you need to recharge it for 2 hours. You can’t use the Tria whilst it charges. So you need to accurately cover as many of your areas as possible in 30 minutes. It’s fine for small areas and the face. There’s a helpful treatment guide in the user manual. It suggests how many pulses you need per body area and how long it’s likely to take. Based on this information and feedback from the online reviews you can treat your face and a couple of small areas with one charge e.g. 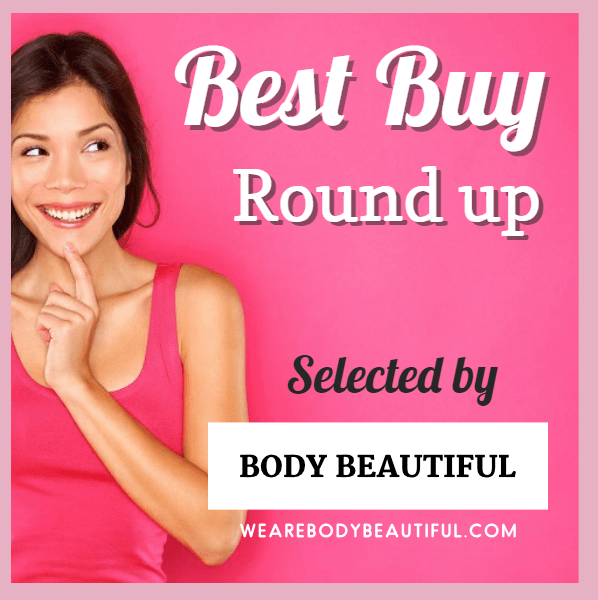 your upper lip, chin, jawline and a pair of underarms or both sides of the bikini line. Those who use it on small areas don’t report any criticism with the battery life. Tria put a positive spin on the battery life (above). 30 minutes is long enough for the high level of precision and concentration required. It works well for smaller areas and the face. So, if you can do everything with one charge, that’s perfect. TIP: If you’re treating a small are that’s hard to reach, you’ll need a helpful assistance. That’;s because the Tria 4X needs close up attention to detail to get accurate coverage. However, for larger areas like legs you need much more time, patience and commitment. You need more than one 30-minute session to do a full leg. It’s also much harder to reach all areas (like backs of knees). So it’s difficult to get good coverage and keep track of where you’ve zapped. Plus, you may run out of charge at an inconvenient moment. Then, after recharging, it’s tricky to remember where you zapped. Especially if resuming the treatment on a later day. Tria suggest you can complete one full leg in a total of 1 hour from 2 charge cycles. This obviously depends on how curvy you are – the reviews share it takes between 2 to 4 treatments to cover a full leg. So, for both full legs for one complete application that’s between 1 to 2 hours total for laser treatment, plus 4 to 8 hours of charging. Then repeat for 8 treatments, 1 every 2 weeks for 3 months. Ouch. This is not for the commitment shy, lazy or those with precious little free time. Charge the Tria 4X immediately after use so it’s ready to go next time. If not in use for long periods of time, charge the Tria 4X every couple of months. This takes care of the battery and stops it degrading. If you don’t it may stop charging altogether which means you can no longer use it. The fan activates during charging. If you don’t want this, long press the power button to activate ‘Quiet’ charge mode (N.B. this takes longer to charge). To prolong the overall life of the battery, use and charge your Tria at a cool temperature, so the battery doesn’t overheat. What do the online Tria 4X reviews say? As of January 2019, there’s almost 700 online reviews for the Tria 4X. 63% of these are positive 4- or 5- star rated, 8% are neutral and 29% are negative 1- or 2-star reviews. The reviews for the Tria 4X date back to 2014. They’re good quality but there’s a lot out there. It’s daunting and time consuming to get a good feel or confidence in the device. I’ve therefore rounded up the negative, neutral and positive feedback to help you decide. Let’s start with the low-rated negative and neutral reviews. 29% of the online reviews are rated 1 and 2 stars, and 8% are neutral. This is quite a high percentage overall. But less than half of these report the Tria 4X doesn’t work. We’ll get to that soon. So, what is it the rest don’t like? By far the most common criticism in the low-rated reviews is the Tria 4X hurts. Over 20% of the low-rated and neutral reviews reviews say so. They say the feeling is much worse than the advertised feeling of a rubber band snapping. They describe it as a sharp burning pain that ‘bites’. The neutral reviews admit it’s “effective but painful”. Whereas some simply use the lower intensity levels, other users numb their skin with ice or lidocaine before use. But others resort to having helpful partners use it on them because it’s hard to inflict the pain on themselves. A few reviewers even return it because they can’t bear the pain. The positive reviews mention pain levels too. Keep reading to learn more. There are some low and neutral reviews which mention faults. Some occur almost immediately and others develop after a few months. Unfortunately, a few occur just after the 1-year warranty expires. The problems are with charging the battery, broken power buttons and errors shown on the LED screen. 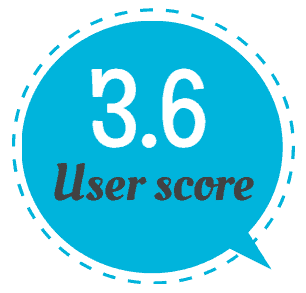 Bear in mind they’re collated from 4 years’ worth of online reviews and they make up just 3% of all the online reviews. They don’t represent a worrying trend. There’s a handful of unfair low scores from reviewers with incompatible skin or hair colouring. A few more are unhappy Tria don’t offer a repair service, so if you knock it over or drop it you’ll need to pay out for a new device. Some mention that over time the Tria doesn’t hold its charge as well so they get less time and flashes to treat their areas. A few more prefer professional treatments. Unfortunately, there are a few reports of skin reactions or users whose hair grew faster and thicker after use. The user manual lists these uncommon side effects. Whilst no such reports would be more reassuring, they do make up only a tiny percentage of the overall online feedback. Other frequent negative comment is the laser aperture is very small so it takes a long time to cover your skin. 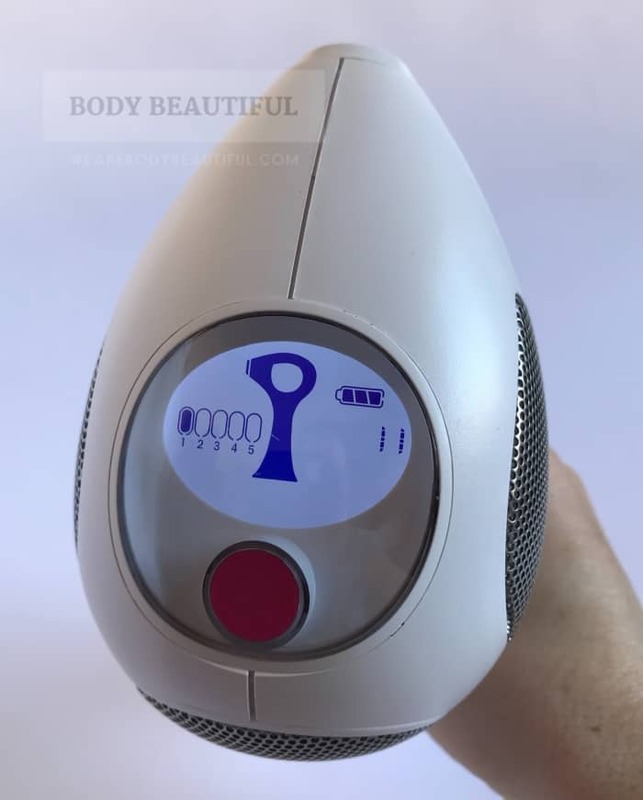 The power lasts around 30 minutes too so you need to charge it several times to complete multiple body areas. It’s a common complaint for people using it on larger areas like arms, legs and torso. Several neutral reviewers recommend it’s good for small areas but not ideal to treat legs. This is shared in the positive reviews too. Several of the neutral reviewers see some results but it’s too early to rate it higher, or they’d hoped to see better results by now. A handful mention their results don’t last forever with hair growing back months after they stop using it. Around 38% of the low and neutral reviews say the Tria 4X doesn’t work for them. So that’s 14% of all the online reviews. Almost half of these reviews don’t say how long they’d used it. So, it’s not clear if they’ve given it long enough to see any results. The rest shared their results either during the recommended 3 months of use or after that. Half report seeing no results at various points within the recommended 3 months. Some tried for only a few uses (up to 1 month), and others gave it up to 3 months. Most of these expected to see fast results. I suspect this is down to optimistic expectations set by Tria. For example, one of the expectation setting statements based on the clinical study is “Tria reduces up to 70% of unwanted hair after just 2 treatments in as few as 3 months.” It suggests you’ll see significant results after just a few uses. However, after reviewing the feedback, this isn’t the case for everyone. More on this in the positive feedback round-up. The other half use the Tria beyond 3+ months and don’t see any results. Time frames range from a handful of users at 4, 6 and 8 months and 4 users at 1 year. Another is still using the Tria 3 years later and, although they have less hair growing now, they rate it low because it’s not all gone and they must shave weekly. A round 5% of the negative reviews score low because they too are disappointed with their results compared to the expectations set. A few don’t think it’s worth the price or their time commitment. A handful prefer the results from professional laser treatments. Others report minimal hair reduction, or it slows and thins hair but doesn’t remove it entirely. And some report their hair grows back eventually, so it doesn’t live up to the ‘permanent’ promise. So, it’s important to fully understand the varied responses to the Tria and fast results aren’t guaranteed. There’s more on this in the positive review feedback. There’s plenty of positive feedback and happy reviewers. Just under 63% of the online Tria 4X reviews rate it at 4 or 5 stars. About 9% of these really like the Tria but unfortunately, they don’t leave much detail in their feedback. So, what do the others like? They love the beautiful packaging and the helpful instructions. They appreciate the Tria 4X is nicely made and because it’s cordless there are no cables to get in the way. Reviewers love the premium feel, beautiful packaging, helpful instruction booklet and cordless operation. The sturdy box is ideal to store this expensive bit of kit. Others like there are no expensive replacement bulbs to buy (as with other home-use devices). And several love it as an alternative to expensive and inconvenient salon visits. Reviewers who use the Tria 4X on smaller areas say it’s lightweight. Others mention it gets heavy if you use it on larger areas. But both agree it’s intuitive and easy to handle. A few share it’s sometimes difficult to position for precise coverage on the backs of legs. And men using it on their chest and back need to seek a helpful assistant to treat their hairs. Loads of the positive reviews don’t even mention pain. Only around 11% share their specific feedback. Approximately 3% of these say it doesn’t hurt or only hurts a bit. They feel it’s less painful than the ‘rip’ of waxing, and more a snap of pain that instantly disappears. 8% say it hurts. And many feel (incorrectly) you must use it on the highest power to see results. For some this is unbearable, but for others they numb their skin with lidocaine or ice so they can endure level 5. And overall, they feel the pain is worth it and still award 4 or 5 stars. Reviewers share they numb their skin with lidocaine and / or ice before their treatment. It’s cheaper and more effective than Tria’s SmoothStart Calming gel. Overall, the positive reviewers feel the pain is worth it for the end results. There’s more criticism that doesn’t affect the positive ratings too. Loads of the reviewers use the Tria to treat their chin, neck and jawline. For these areas you can finish within 30 minutes so the small aperture is not an issue. But for larger areas or multiple body areas it’s a time-consuming business. They also share it’s difficult to remember where you’ve zapped, especially on large areas when you must stop to recharge the battery. The battery charge gets several mentions too. Many say it’s good, and with around 600 zaps / 30 minutes of use they can cover small areas like their underarms. From the feedback it takes between 4 to 8 charges to complete a pair of full legs. Some deduct a star because they can’t treat all or multiple areas in one day. Other reviewers take a different approach. Instead of attempting multiple charges and treatments in one day, they use a single charge at a time and alternate their body areas over the recommended 2-week cycle. Overall, the consensus is that although they’re limited by the battery life it’s worth the patience and commitment to see the end results. Many of the positive reviews share they love the Tria because it’s cheaper and more convenient than professional salon visits. Some get comparable speed of results, whereas others need more treatments. They appreciate it is a slow process and you must dedicate yourself to it. But they feel it’s worth it for the results. So what results do they share? Of the 4 and 5-star reviews, around 61% specifically say it works (or 37% of all the online reviews). Almost a quarter unfortunately don’t say how long they’ve used it for. But the rest do and it follows the Tria guidelines. Tria recommend a treatment every 2 weeks for up to 3 months, or until you’re satisfied with the results. You can do more treatments beyond 3 months if required. In smaller print on the website they advise it’s after 8 uses (around 3.5 months) that most will achieve a substantial visible reduction in hair regrowth. Comments from Tria Customer Service on Amazon reviews suggest it’s after 6 months of use you’ll see permanent results. So, it’s a long process. Then do top-up treatments as you need them too. N.B. It’s notable that a lot of users decide to use it weekly or even more frequently. This increases the chance of side effects and it’s unlikely it speeds up your results. Instead it serves to shorten the life of your Tria expending more flashes and battery charges. Around 20% share they’re seeing fast results at between 1 to 3 uses. Initial effects are hair grows slower with each treatment. Then thinner, lighter and softer. For others bald spots appear and there’s less hair that grows back. This ranges from a ‘noticeable’ amount to a ‘drastic reduction’. Shaving becomes less frequent, and it’s easier because the hair’s much finer and soft. So, no more stubble, shaving bumps, irritation or ingrown hairs! Another 17% see results within the 3-month start-up stage. However, the speed of and amount of hair reduction varies by person. For example after just 3 uses, one happy reviewer is hair-free and has “a baby smooth stomach with no regrowth”,whilst another male user reports 60% less hair in his quest for a Brazilian. It takes 4 uses for one lady to see a 50% reduction in hair whilst another gets 90% reduction on her chin after the same time. And a handful need more than the suggested 3 months’ worth of treatments to get their desired results. And the speed of results tends to differ by body area too. But there’s no distinct pattern from the reviews. A good number share their feedback after the 3 months start-up phase too. Some are hair-free or almost hair-free at 6 months and do top-up treatments to stay smooth. For others they still have hair slowly growing but it’s much lighter, softer and finer and they’re happy because they need to shave much less frequently. Reassuringly, a handful share their results have lasted years. And they need only occasional spot treatments to keep new hairs in check. In conclusion, the speed, amount and lifespan of results varies by person. Check your expectations, because it may take patience and time to get the results you want. But is the Tria 4X laser permanent? Tria 4X laser: permanent hair removal? 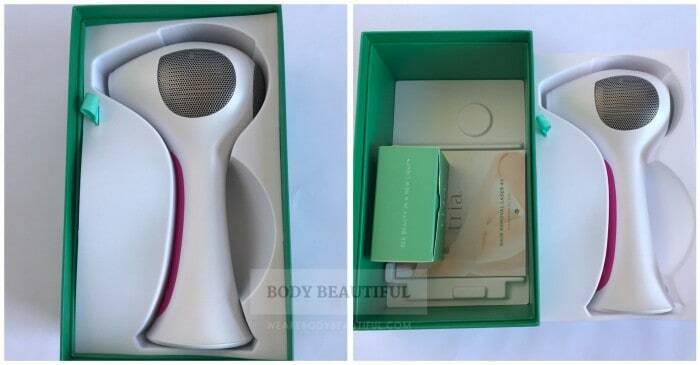 Triabeauty.co.uk say because the Tria 4X is a laser it gives you ‘permanent hair removal’. That’s compared to home IPL devices, which give ‘permanent hair reduction’. 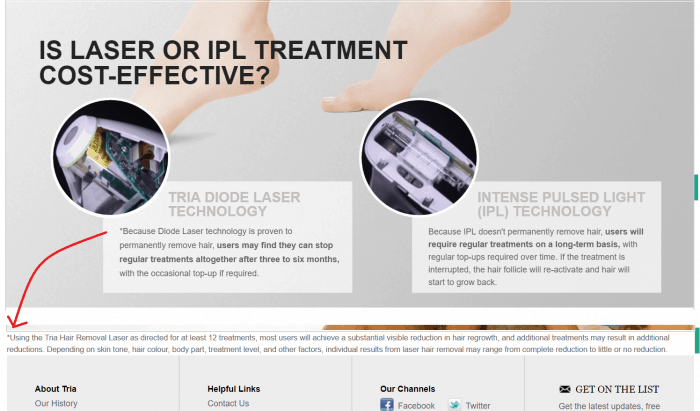 They dedicate a whole web page to laser vs IPL and why they say the Tria laser technology is superior to home IPL. 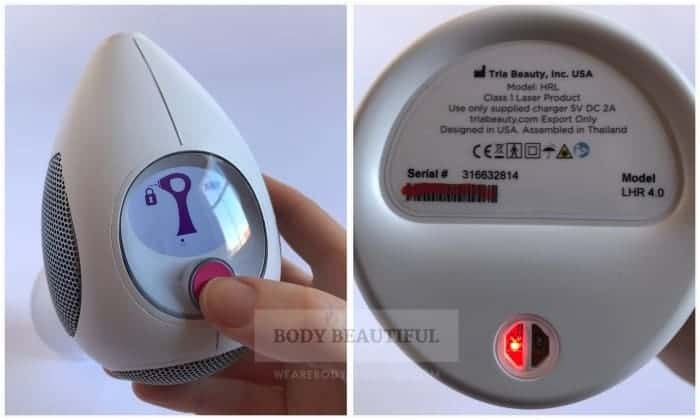 (Feb 2019) Tria Beauty UK say IPL gives permanent hair reduction, implying it could grow back. They also say Diode Laser technology is proven to permanently remove hair so with their Tria 4X laser your hair won’t ever grow back. But is this true and what is it based on? Now, given the choice I’d choose permanent hair removal over permanent hair reduction, right? That’s because it sounds, well, more permanent. If something’s removed, it’s no longer there. And if it’s permanently removed it can’t come back. So, ‘permanent hair removal’ is a powerful claim. But I have a few concerns to share with you. Here goes. Most reputable aesthetic clinic website’s say laser hair removal gives permanent hair reduction results. Some say up to 90% “permanent hair reduction that lasts”1,2. It’s an accepted industry term. The Tria 4X uses the same (but less powerful) diode laser technology as in some of these clinics. So, how can it claim permanent hair removal and they don’t? Screen grab from TriaBeauty.co.uk Feb 2019. This states diode laser is proven to permanently remove hair. I can’t find any study proving this. Also, clinics with more powerful diode lasers don’t make this claim. Confusing. To confidently say hair is permanently removed, the hair follicle must be destroyed entirely. Then there’s no way the hair can grow back. And only electrolysis does this3. Laser hair removal sends focused light energy to your hair root, which heats up the melanin there and in turn damages the follicle. This causes the hair to stop growing and enter the dormant stage (called Telogen phase). This process is called selective photothermolysis. Intense Pulsed Light uses the same process (but with a broad-spectrum light energy). The end result for both is the same. A dormant hair follicle in the resting phase. But the hair follicle is still intact. Therefore, with laser and with IPL it can become active again and hair could grow back. Earlier, I mentioned the ‘Laser vs IPL’ information on Triabeauty.co.uk. On the whole the information on this page is correct. Although it’s presented to imply home Laser results are superior to IPL. But there’s a small and interesting disclaimer at the bottom of the page. So, after 3 months of use, at best you’ll get awesome hair reduction results. At worst, it may do nothing. Or anything in between. Because results vary by individual. It seems Tria Beauty are covering all bases, but heavily promoting only the very best outcome. I think this sets potentially harmful expectations based on the promise of ‘permanent hair removal’. In the US, home IPL and laser hair removal machines are regulated by the FDA. They also control the claims they can make about results. Some manufacturers get permission (or clearance) to market their devices for ‘permanent hair reduction’4. This is what the Tria 4X laser has, FDA clearance for permanent hair reduction. So, in the US, that’s how Tria can promote it. There, Tria don’t say the 4X laser gives permanent hair removal because they aren’t allowed to. In the UK, there’s no such regulation. 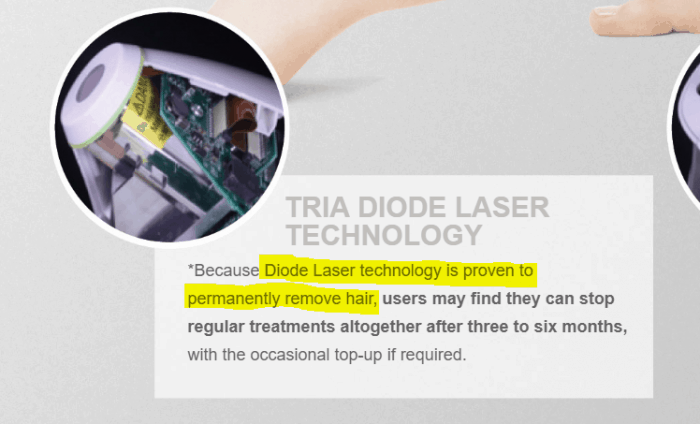 Tria Beauty UK can say the Tria 4X laser gives permanent hair removal if they want to. Yep, it’s no clearer. According to the Adverting Standards Authority, Tria Beauty should ‘hold evidence to support their claims’ for permanent hair removal5. So, I asked Tria Beauty UK to help clear it up. I got a quick response with a description of the differences between laser and IPL. It strongly implies laser gives superior results. But it lacks sources and evidence. However, Tria also shared a 2012 clinical study (it’s available on the website too). The study is called “Permanent Hair Reduction with a Home-Use Diode Laser: Safety and Effectiveness One Year after Eight Treatments”6. In this 2012 study, the Tria 4X laser was tested on 13 subjects. Each had 3 test sites on their leg, 1 per intensity level plus an untreated control site. They had 8 monthly treatments, with intervals of follow up hair counts up to 12 months after the treatments. The study is interesting, comprehensive and thorough with reassuring results. The key results are a mean average percent hair count reduction of 44%, 49%, and 65% at 12 months after the last treatment at intensities of 7, 12, and, 20 J/cm2 respectively. Also, 38% had more than 80% hair reduction at 12 months after the 8th treatment. This includes 1 subject who has 100% hair reduction. Impressive. But does this prove permanent hair removal? The study conclusion does go on to summarise other benefits based on the reassuring results. It suggests that after 8 sessions at the higher intensities most users will need to shave less, if at all. That’s because of the high hair reduction rate and evidence that regrowth is finer, lighter and less noticeable. It also notes these results appear to be of a ‘permanent nature’ and by that I interpret ‘long-lasting’. The study also recommends you can do more than 8 treatments to get even better hair reduction results. So, I understand Tria’s angle here. They recommend 8 treatments every two weeks (vs monthly in the study) to see noticeable hair reduction results. But with up to double that you can get even better results. Thus, 6 months of treatments is the recommended optimum for best results. This still doesn’t prove permanent hair removal though. I also asked Tria Beauty if they had a comparison results study for the Tria 4X and any home IPL devices. They didn’t share anything. And trying to compare separate studies is frustrating because they have different approaches, timeframes and measurements. There’s no direct comparison. What I can conclude is that all study subjects see good permanent hair reduction results with both home laser and IPL. Tria also says with IPL “some users may feel an increased level of discomfort”. They say because the diffuse light energy travels through your skin creating heat. With the Tria on the other hand “some users might feel the sensation of a rubber band snapping against the skin or a warm pricking feeling, while others report no discomfort”. The Tria sounds favourable based on this, but I’m not sure it’s the full picture. A few comparison studies of professional diode laser vs professional IPL systems show conflicting results on this. So there’s no conclusive independent verification. It does depend on the user. 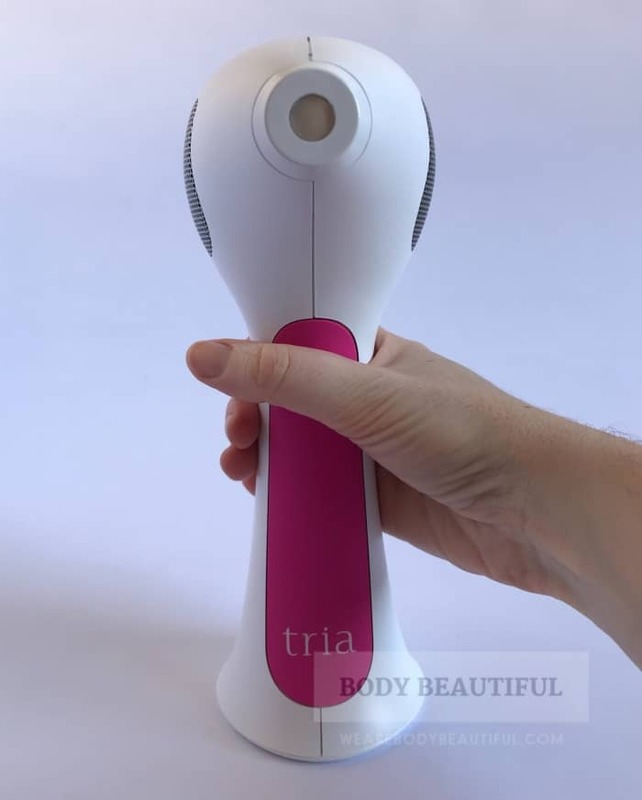 But don’t miss the section earlier in this review on ‘does it hurt?’ and also a comparison of the Tria 4X with a home IPL hair removal device here. Will you get permanent hair removal? The clinical study shows that one participant did get 100% hair reduction, and it lasted 1 year. But does this mean you will? I think the online feedback is most helpful here. We learned earlier that results vary by user. Some get significant results in a few goes and are hair free soon after. For others it takes much longer. Some never get to totally hair free. And results last different amount of times too. For some the hair hasn’t grown back after a few months, for others it’s years. For others it grows back if you stop regular use. And some are still using it regularly a year or so later. The results feedback for the Tria 4X laser matches most other home IPL devices. Check out the other reviews to learn more. “Permanent hair removal” is an attention-grabbing statement. And some people will choose the Tria 4X laser over other choices because of this promise. But I’m not convinced you get permanent hair removal with the Tria 4X laser. I don’t see the proof. Permanent hair reduction, just like IPL devices, seems more appropriate. So, don’t make a decision based on this alone. In practise, user feedback shares the end results are similar with home IPL, if not the same. It’s true and proven through independent studies the higher the intensity level you use the better the results. So it follows the more powerful Tria gives faster and longer-lasting results. IPL may take more treatments to reach the same results. But don’t be blinkered by this alone because the journey is different with each too. Make a more informed decision by understanding how they differ in use to see which best suits your needs. It’s a personal choice. 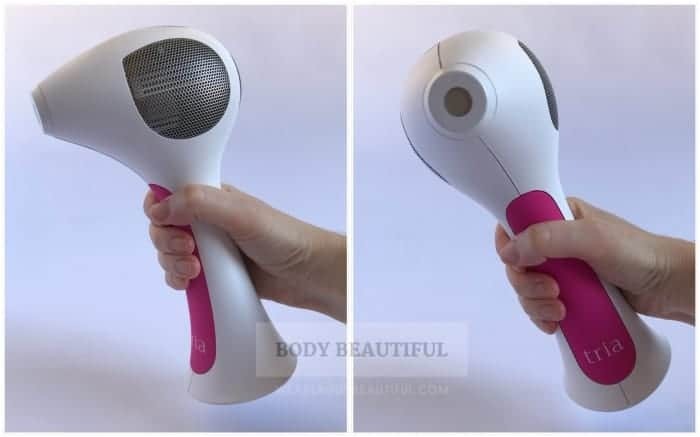 This review should help you decide and you can check out this comparison with the Lumea Prestige IPL too. Here’s a quick round-up of the pros and cons for the Tria 4X to help you decide. Should I buy the Tria 4X? The Tria 4X is a great choice if you’re very committed and able to dedicate time and patience for the duration. The Tria 4X is the only laser hair removal device clinically proven safe and effective for home use. It’s cleared by the FDA too for extra reassurance. It’s powerful, intuitive and very easy to use. A quality bit of kit. But bear in mind for some it hurts. And treatment times are slow and limited to 30 mins by the battery charge. So, you’ll need to plan around this. If you’re happy with this, I think it’s a great choice for treating your face and smaller areas like underarms and bikini area. Most choose the Tria because it’s the most powerful available for home use and it follows you get your best and longest lasting results. But this does mean a compromise. 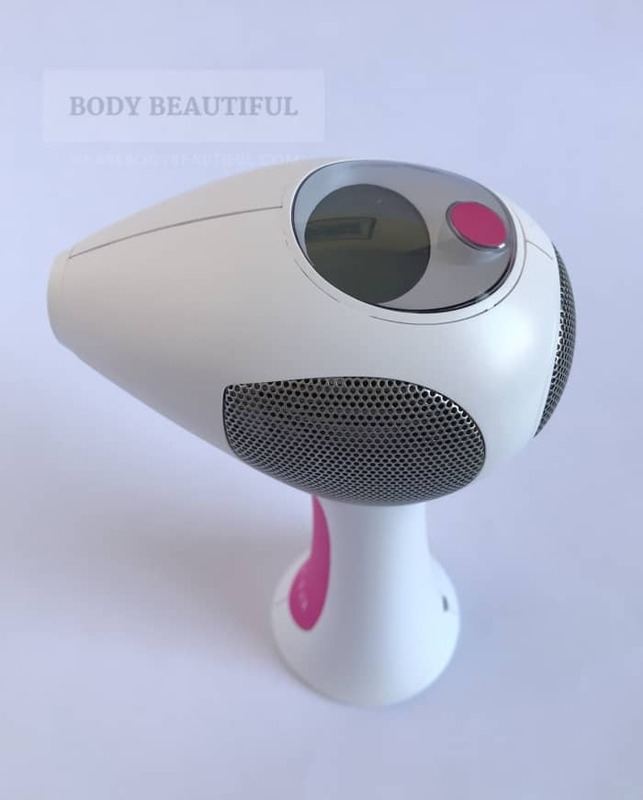 It demands the most amount of time, patience and commitment from all the home-use hair removal devices. It may not suit everyone. But if your mind’s made up, it’s a splendid choice. Go for it. N.B. 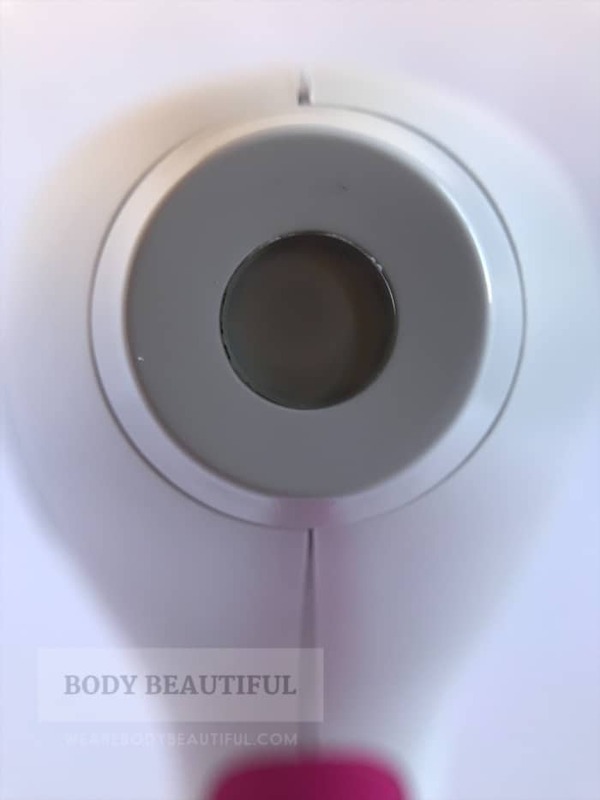 If you’re not sure, check out my comparison with the leading home IPL device. 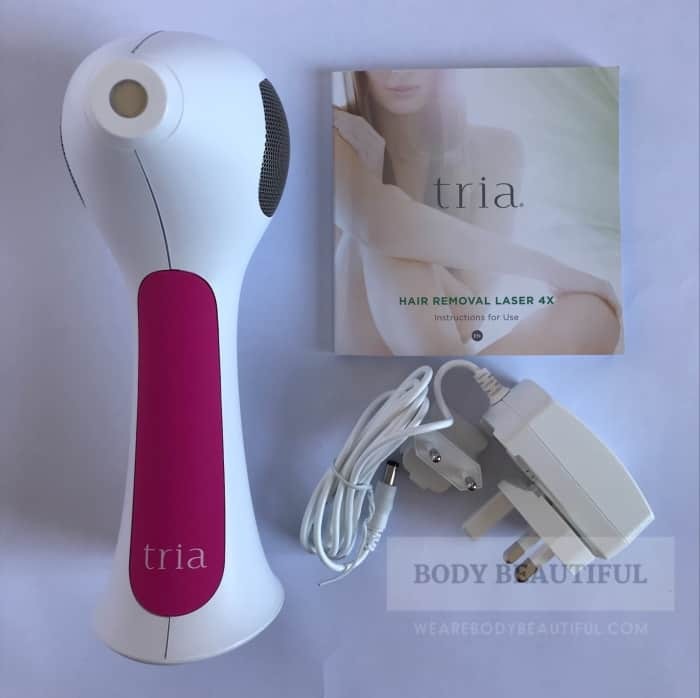 You can check prices or buy the Tria 4X laser using the links below. Best for face and small areas with light to medium light skin tones.